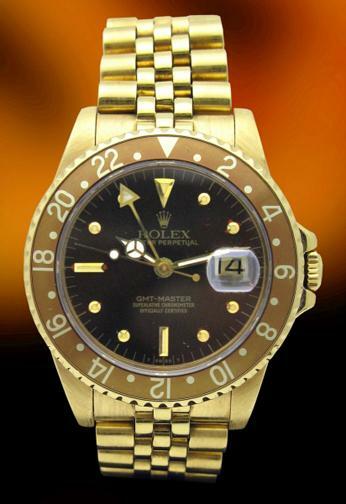 This is an extremely collectible and rare Rolex Ref. 16758, known to collectors as the “GMT Master” which was produced from approximately 1980 until 1989, and succeeded the Ref. 1675. This timepiece has a beautiful original brown dial, which has taken on an attractive patina with age. The watch is in exceptionally nice condition, with a mint 18KT yellow gold case, and comes on a 18KT yellow gold Rolex Jubilee bracelet.